Leading Manufacturer of ss / ms crystallizer and ss crystallizer from Navi Mumbai. Our clients can avail from us an brilliant range of Fluidized Bed Crystallizers that are designed and manufactured as customized products for various process applications.These crystallizers find application in various industries such as pharmaceuticals, fertilizers, agriculture, paper & pulp, power plant and construction industries. This crystallizer is highly demanded and appreciated by our patrons due to its high performance and durability factors. The produced crystals are pure and they do not contain impurities like water, reagents etc. To cater to the requirements of our clients' consideration, we are actively engaged in providing SS Crystallizer. 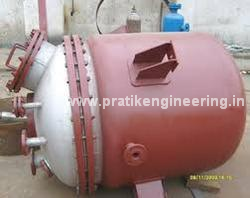 The offered crystallizer is available in different specifications as per the variegated requirements of our customers. Our given crystallizer is developed with optimum grade material & latest technology by our adroit workforce. Also, we provide this crystallizer to customers within given confine time at industry leading rates.